Time Location Plus is software to provide a clear and efficient interface to create Time Location charts (often known as Time Chainage charts, Time Distance charts or Space Time charts) which are highly flexible in content and appearance. 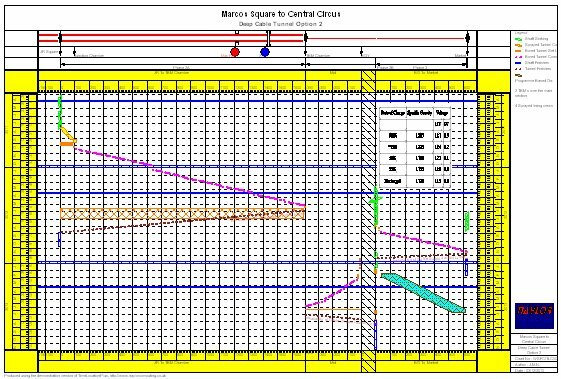 This long established software, first launched in 1998 and continuously updated since, allows data to produce a chart to be imported in seconds direct from most popular planning packages. Alternatively data can be cut and pasted from spreadsheets or drawn directly into Time Location Plus. Forget about bloated user interfaces, complex wizards via Excel and incomprehensible tools to produce a chart. Time Location Plus has been engineered to provide the most advanced functionalities in their simplest form by direct interface with planning packages. Creating Time Chainage Charts is often a painful process but thanks to Time Location Plus a sophisticated and accurate time chainage chart is just a few mouse clicks away! All necessary features are fully available in the finished chart. Multiple sections, flexible shutdown periods, headers, pictures and notes make the appearance of the chart fully customisable. Distances can be in m, km, miles, yards and chains, and each section can run from low chainage to high chainage or from high chainage to low chainage, the choice is yours. 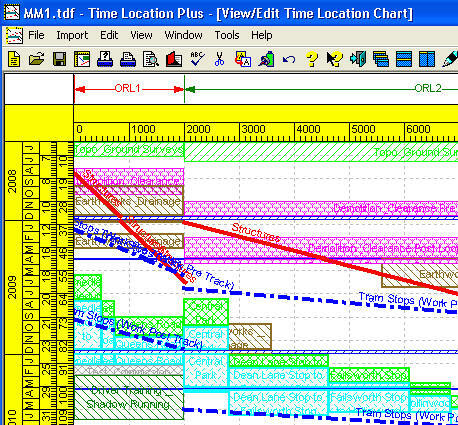 Time Location Plus interfaces directly with Microsoft Project, Asta Power Project, Asta Teamplan, Primavera P3 and Suretrak. It imports directly from Primavera .xer files so can be used with any version of P6 (P3e, P4, P5, P6, P6 v7, P6 r8, Contractor, Risk Analysis). In case you are not using one of these packages Time Location plus will also import data from MPX files, Excel and comma separated files, so no matter which package you use Time Location Plus should serve your needs. And if your project is so simple that a bar chart planning package is not in use then you can draw and edit the data directly on screen. So download a free copy now and to start using Time Location Plus the fastest Time Chainage Package on the market. F.A.Q. - Gives answers to some common questions. Help File Extracts - Provides some illustrative pages from the help file.